It ain't easy fighting Thanos! Rocket and battle-ravaged Thor stand on a terrific diorama base. 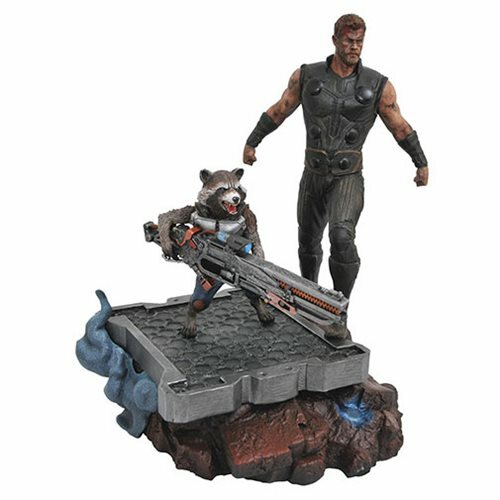 The Marvel Premier Coll Avengers: Infinity War Thor and Rocket Raccoon Statue features a heavily armed Rocket with a battle-ravaged Thor atop a diorama base. Sculpted by Rocco Tartamella, this superbly detailed resin statue is a hand-numbered limited edition of 3,000 pieces with an accompanying certificate of authenticity, in a full-color hand-numbered box. Ages 13 and up.